As part of AFP Central Texas’ continued commitment to it members to provide value-added services, the following Memorandum outlines the commitment required from both Mentors and Mentees as part of our Mentorship program. To promote fun through shared experience and practice. Help the AFP Mentorship Chair support the program by completing an evaluation form at the end of the partnership. Help the AFP Mentorship Chair support the program by completing an evaluation at the end of the partnership. 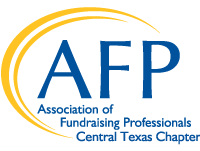 For more information on the AFP Central Texas Mentor Program, please contact Mentorship Chair Trudy Woodson.